The side channel high vacuum pump is a vacuum pump that works from atmospheric pressure to the high vacuum range. This pump is a combination of a side channel pump (pressure range 1,000 to 5 hPa, laminar flow) and Holweck stages (pressure range 5 to 10-5 hPa, transitional and molecular flow). 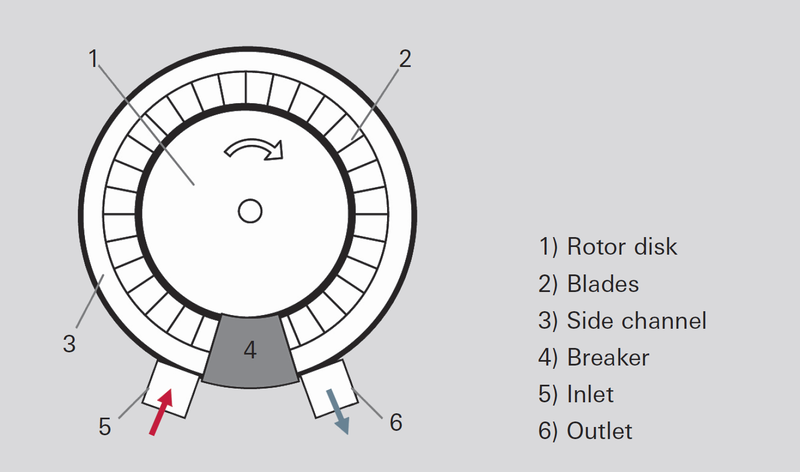 The pumping system in a side channel vacuum pump (Figure 4.20) consists of a rotor disk (1) having blades (2) that are arranged on the outer perimeter and a ring-shaped working chamber, the side channel (3). The side channel is narrowed to the disk profile at one point by a breaker (4). The pumping effect occurs through a helical flow from the inlet to the outlet that is produced by the blades of the rotating rotor. This results in a pressure differential between inlet (5) and outlet (6). Lower ultimate pressures can be attained by connecting multiple pumping stages in series. At pressures of between 1 and 20 hPa, the pump leaves the laminar flow range, and a Holweck stage takes over displacement of the gas. To adapt to the pressure of the side channel pump stages, which is still quite high, the Holweck channels are small on the vacuum side and the gap is narrow. Larger channel cross sections are used toward the suction side in order to increase the pumping speed.